The fitness industry today has reached its peak in providing all fitness enthusiasts all the convenience they need to continue the workout no matter where they are. The main goal of indoor cycling bike manufacturers is to provide quality-driven, reliable indoor cycling bikes that suit the needs of every user. Currently, hundreds of spin bikes now exist in the market that offers a wide variety of benefits and interesting features. The variety of choices causes the buyer confusion in choosing which is the best. Because of the existing competition in the market of spin bikes, there are models that are now affordable for everyone. So, some of the gym goers and outdoor bikers, discover the advantage and the convenience of working out of their own home. Having your own spin bike at home is the most practical way of trimming your body. You can focus on your without the hassles of traveling to the gym and paying for registration, or without the hassles of biking outdoors and putting yourself at risk for injuries in the road. So, want to have your own spin bike? Then choose the spin bike that is on sale now. They are still in good qualities and still give the best performance. The best thing is, you can buy a spin bike under $500 only. First time to buy a spin bike? Then we will teach how to buy a spin bike that is still in perfect condition even cheaper than the others. 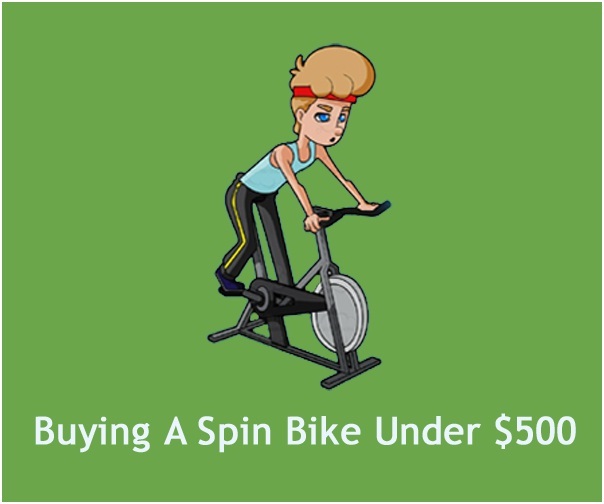 Check out what are the things that you should consider when you buy a spin bike under $500. Flywheel – The flywheel should be reliable. The heavier the flywheel the smoother the biking experience will be. If the flywheel is heavy, it guarantees sturdiness that will hold even your momentum increases. Seat and handlebars – Check the seat and the handlebars, they should be adjustable for your convenience and comfort. Comfort during workout plays an important role in achieving an effective result. So, the adjustability of the seat and handlebars will aid in giving you comfort. The well-padded seat and the handlebars can constantly maintain firm gripping even when your hands are sweating. Pedal system – If you are cycling intensely up and down, the pedal system will not fail you since it has toe baskets that will securely situate your feet to the pedals, preventing your feet from slipping. Resistance level – The resistance level should also be adjustable. Some use magnetic technology while others use the belt drive. Choose between the whichever you are comfortable. But mostly, the belt drive spin bike is more recommended for home use because it does create annoying noises even doing an intense workout. Stability – always check for the stability of the spin bike. If it wobbles during the workout, then it will be a hindrance in achieving an effective workout. Frame – most of the durable spin bikes have a steel frame. Always check the frame if it is made of durable material that it will not easily wear off, wobble even in an intense workout. All in all, in the buying a spin bike under $500 for home use, you should always consider the durability and the performance of the spin bike can offer. It has been revealed by the numerous indoor spinning cycle reviews spread throughout the internet that the spin bikes under $500 are not sold cheaply because of some malfunctions or incapabilities. They still perform well, like those expensive models. Practically, these spin bikes will satisfy your demands for quality, stability and effectiveness as far as indoor cycling is concerned. Yes, they are affordable but they can be trusted just like the expensive spin bikes sold in the market. In fact, some of the spin bikes reviews under $500 would prove to you that they performed better than some of the high-priced bikes in terms of durability and maximum performance. When you have a spin bike in your own home, then you can easily maintain your workout and with this affordable price, this will be the best investment for you. Choose wisely when buying a spin bike for home use. Remember all the listed things that you should check when choosing a spin bike. Previous Why We Should Go For Garage Shelving?